Over the last 30 years, we’ve designed and manufactured thousands of custom POP displays for companies in dozens of industries. Every product presents its own set of merchandising challenges. Creating an interactive POP display for a consumer electronics product can be technically challenging. Bulky products like pillows and dog beds have their own set of merchandising challenges, not to mention finding creative ways to display products like electric toilet seats, automobile decals, adult diapers, roofing tiles, and ice augurs. But, relative to the merchandising challenges we encounter with some of the examples listed above, we find creating custom POP displays for the wine and spirits industry to be perhaps the most challenging of all. Why? ● For starters, it’s a very demanding industry from a creativity standpoint. A lot of the merchandising concepts are driven by brand teams and ad agencies that are often highly creative. However, the originators of these concepts tend to have less experience in engineering and manufacturing, which often makes it challenging to execute the POP display in a way that aligns with their vision. ● Third, display budgets are always tight so creating custom POP displays that are cost-effective while also being creative can be tricky. ● Fourth, from a design and engineering standpoint, most of the displays for the wine and spirits industry need to be able to knock-down in a box small enough to fit in the back of a sales rep’s car. ● Finally, because there are so many people involved in the process of getting agreement on a POP display, the decision-making process is often protracted and timelines for designing and manufacturing displays are often short. 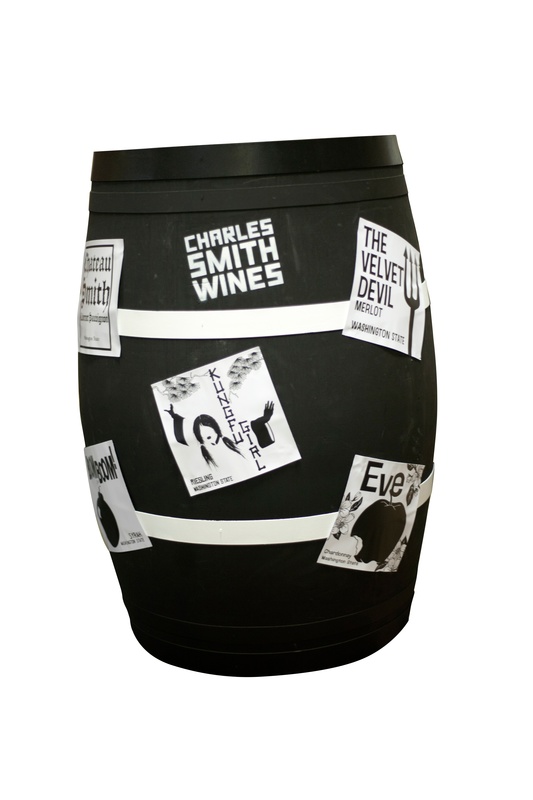 The first example shown below is an authentic decorated wine barrel for Charles Smith Wines. 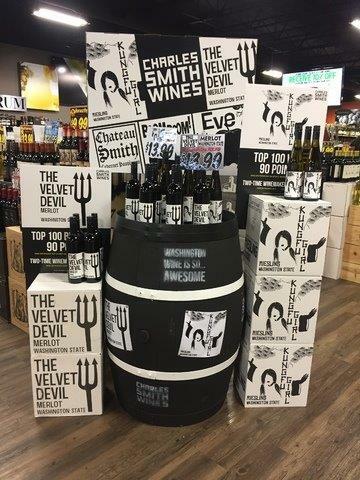 Designed to be direct and quirky to fit the brand aesthetic, this wine barrel featured the black and white color scheme of the brand with a painted black barrel, white painted metal bands, stenciled graphics, and vinyl branded add-on graphics. An in-store shot of the barrel fully merchandised is also shown below. Our second example is a partial staircase we made for the well-known brand Woodbridge. The idea was to create a display that would bring shoppers into their home where they can enjoy a glass of Woodbridge wine. We built a staircase out of MDF and stained solid wood. 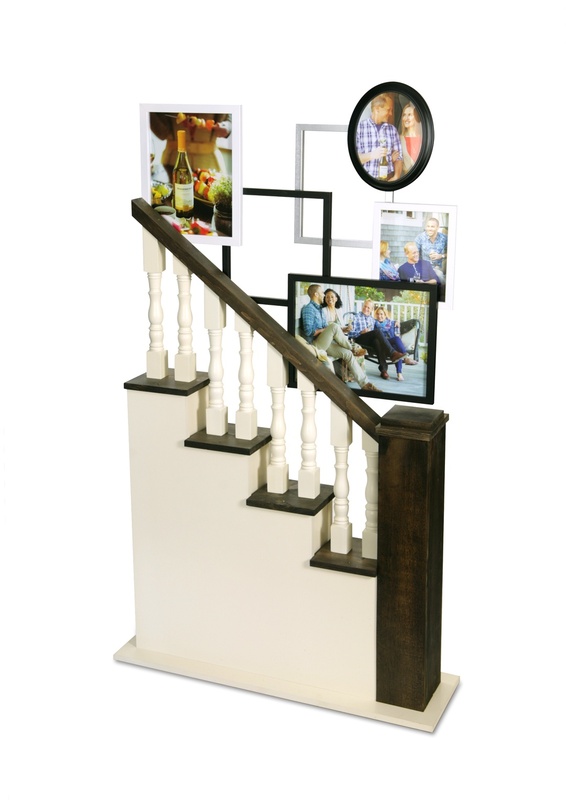 We used real staircase spindles and mounted picture frames with 2-sided pictures. Our third example is an outdoor arbor display we made for the Kim Crawford brand. 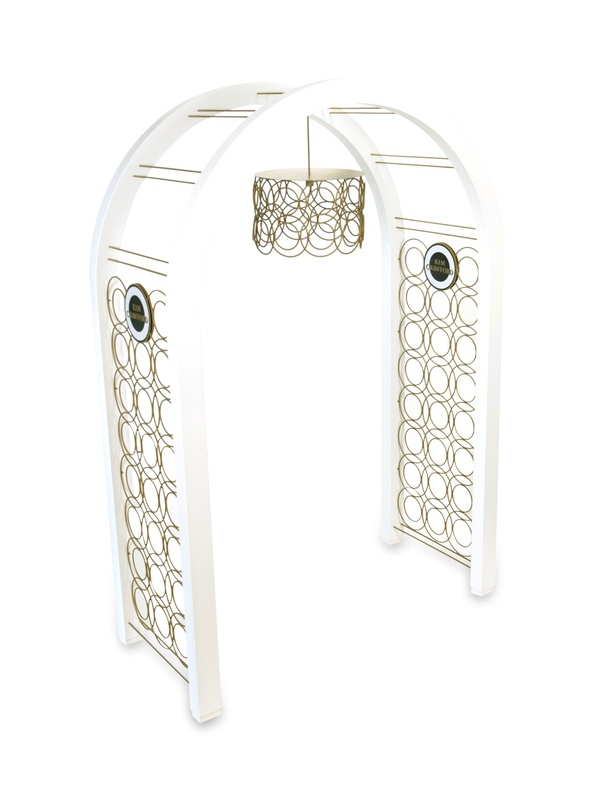 Designed to evoke pleasant summertime memories, this branded arbor featured a set of painted MDF arches, side wire ring panels with Kim Crawford branding, wire connecting rods, and a hanging metal chandelier. 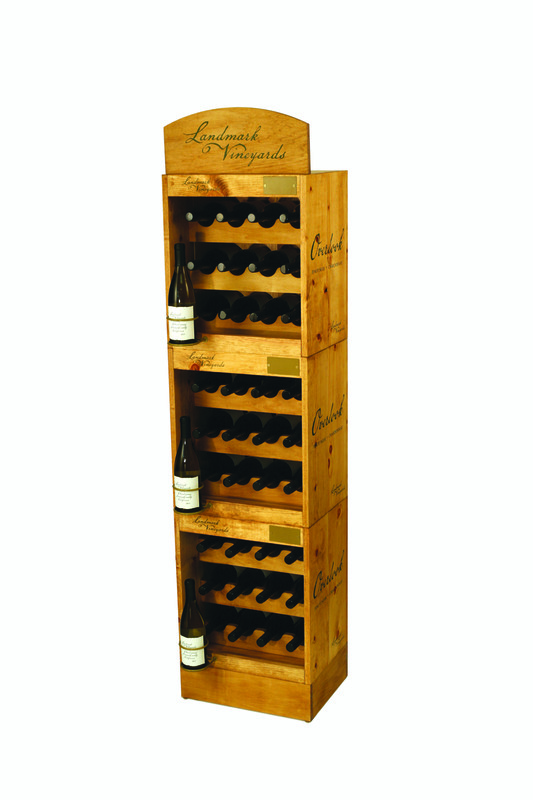 Our final example today is a little more traditional, but we wanted to share it since it is an example of a solid wood display that we made for Landmark Vineyards. This 3-tiered modular display was constructed using solid pine which we finished with a golden oak stain. The display featured contoured wood holders for lay-down bottles, metal logo plates, single-bottle glorifiers, and side and header screen printed graphics. Custom POP displays are vitally important for the wine and spirits industry and always a good source of creative inspiration.